Rumored 2013 "Grape" 5 re-release is the real deal. There probably isn't a single Air Jordan shoe rumored to be re-released more often than the "Grape" 5. The game's biggest myth may be that bogus Grape/Laney Pack that many thought would drop last summer. Of course the pack never saw the light of day and we're still waiting on a "Laney" reissue, but those in need of a fresh pair of "Grapes" will be able to do so next spring. The now confirmed "Grape" re-release is targeted for an April/May release, the latter being more likely. The price is also penciled in at $160, though we're all VERY aware that can change. 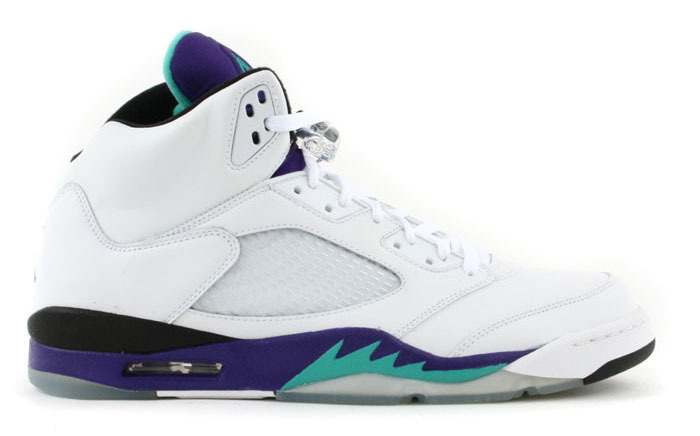 "Grapes" last dropped in 2006, but will be back on the market in celebration of the Air Jordan 5's 23rd Anniversary. How many pairs will you be picking up? Correction: how many pairs will you try to pick up?